Popular for its central location and great land value appreciation, Highland Village is a small deed-restricted neighborhood nestled between the Galleria and the Greenway Plaza. PROXIMITY TO GREAT RETAIL AND DINING: The Highland Village Shopping Center, one of Houston’s earliest shopping destinations, is a stone’s throw away from the neighborhood. Landscaped and lined with upscale retail and dining options, the shopping center has been around since 1957. Today, it has more than 60 luxury boutiques, restaurants, and commercial establishments. NEAR BUSINESS AND EMPLOYMENT: Nestled in the area between the Galleria/Uptown Houston and Upper Kirby/Greenway Plaza, Highland Village homes are blocks away from two of Houston’s key business and employment hubs. The 17th largest business district in the US, the Uptown/Galleria area features more than 2,000 businesses and 23 million square feet of office space. GREAT IB WORLD SCHOOLS: Three of Houston ISD’s International Baccalaureate World Schools serve Highland Village homes. St. George Place Elementary, Lanier Middle, and Lamar High School are among the best schools in the Inner Loop. QUIET COMMUNITY ATMOSPHERE: Like most of Houston’s pocket subdivisions (Lynn Park and Oak Estates), Highland Village is deed-restricted. Architectural guidelines, deed covenants, and an active HOA (Highland Village Civic Club) have helped maintain the neighborhood’s overall look and feel. SHORT COMMUTES: The neighborhood has easy access to main districts via major roads and freeways nearby, including Loop 610, Southwest Freeway, Willowick Road, and Westheimer Road. 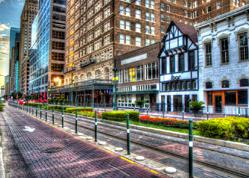 The Texas Medical Center and Downtown Houston are both conveniently accessible from the neighborhood. Buying or selling a home in Highland Village can be challenging due to the neighborhood’s deed restrictions, older homes, and proximity to railroad tracks (which can affect resale values). 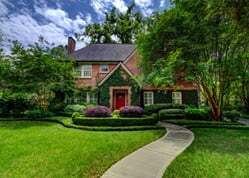 Contact Paige Martin, one of Houston’s Best Realtors and one of Highland Village’s most active real estate agents, if you’re looking to buy or sell Highland Village homes for sale. Enter your email to get this free Highland Village guide in easy-to-read PDF format. Bonus: Also see how this area compares with nearby top neighborhoods. The Highland Village Shopping Center, one of Houston’s earliest shopping destinations, is a stone’s throw away from the neighborhood. Landscaped and lined with upscale retail and dining options, the shopping center has been around since 1957. Today, it has more than 60 luxury boutiques, restaurants, and commercial establishments. Nestled in the area between the Galleria/Uptown Houston and Upper Kirby/Greenway Plaza, Highland Village homes are blocks away from two of Houston’s key business and employment hubs. The 17th largest business district in the US, the Uptown/Galleria area features more than 2,000 businesses and 23 million square feet of office space. Three of Houston ISD’s International Baccalaureate World Schools serve Highland Village homes. St. George Place Elementary, Lanier Middle, and Lamar High School are among the best schools in the Inner Loop. Highland Village real estate have posted steady appreciation rates over the past decade. The median sales price is at over $700,000. 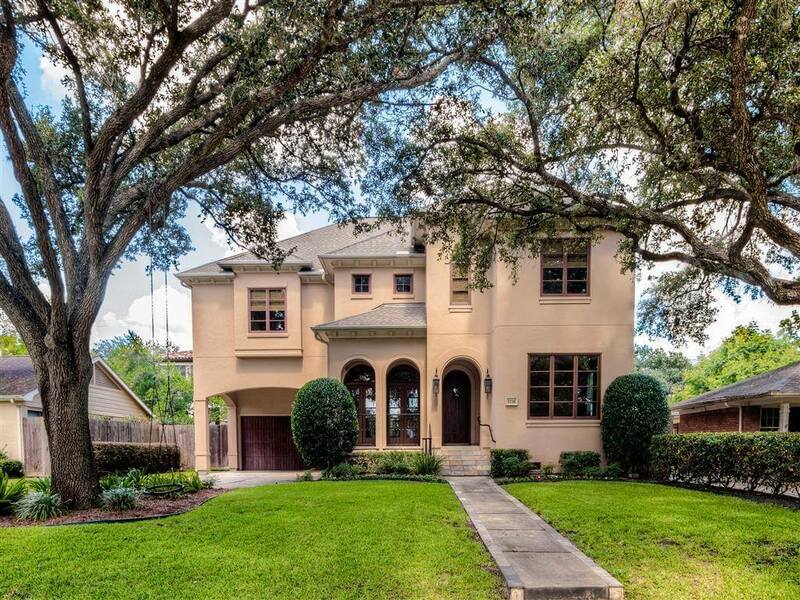 Land value appreciation in the neighborhood are also among the best in Houston. Like most of Houston’s pocket subdivisions (Lynn Park and Oak Estates), Highland Village is deed-restricted. Architectural guidelines, deed covenants, and an active HOA (Highland Village Civic Club) have helped maintain the neighborhood’s overall look and feel. 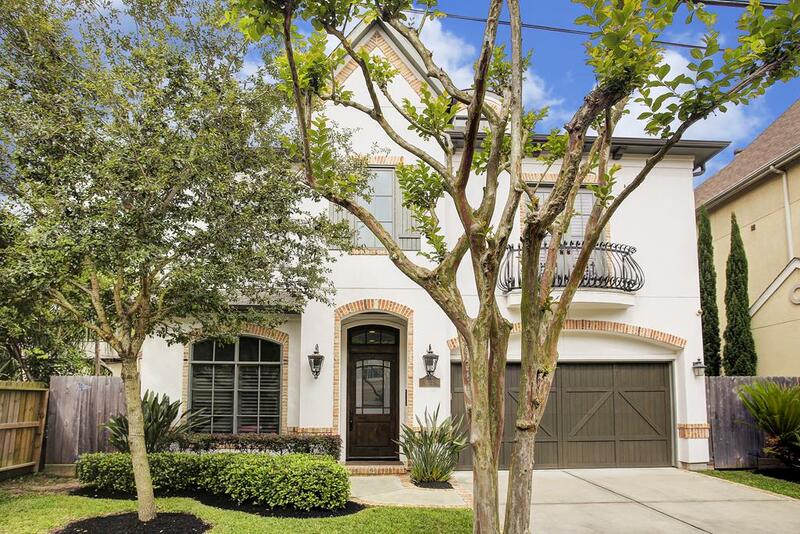 The neighborhood has easy access to main districts via major roads and freeways nearby, including Loop 610, Southwest Freeway, Willowick Road, and Westheimer Road. The Texas Medical Center and Downtown Houston are both conveniently accessible from the neighborhood. Established sometime during the mid-1940s, Highland Park was spearheaded by S.N. Adams, who was also the developer behind Oak Estates and the Highland Village Shopping Center. Highland Village is a mixture of old and new, ranging from the neighborhood’s original ranch-style homes and new construction homes. Other retail centers are also nearby, including River Oaks District, the Galleria, and Uptown Park. Homes in the neighborhood can offer between 3 to 5 bedrooms, with around 1,700 to 8,000 square feet of living space. Traditional architecture – mostly ranch-style – is common in the area. Lot sizes are mostly between 6,000 to more than 9,000 square feet. Prices for Highland Village homes for sale can start at around $400,000. Newer homes are typically priced higher and can go for more than $3,000,000. 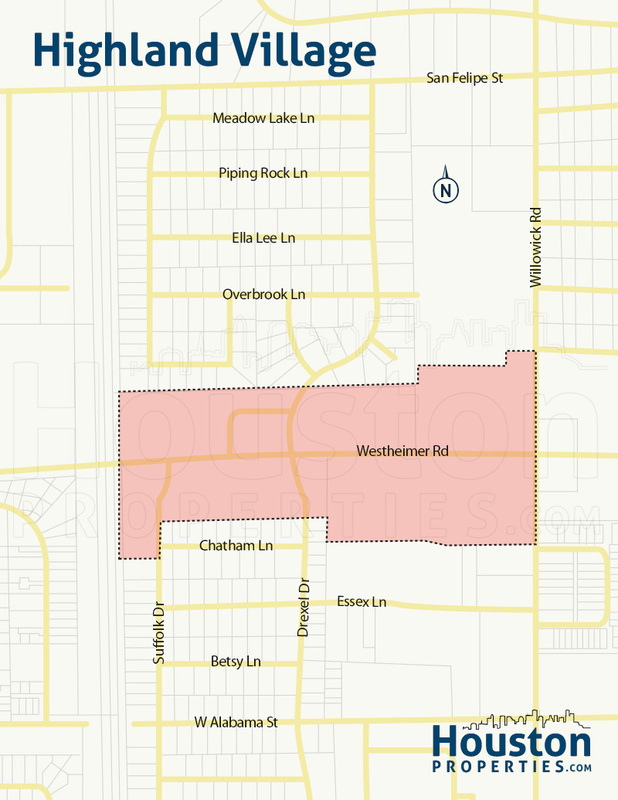 Highland Village is a small subdivision nestled just south of Westheimer Road. The Highland Village Shopping Center, one of Houston’s oldest retail destinations, is directly north of the neighborhood. Located near the intersection where Loop 610 and Southwest Freeway meet, Highland Village is between two major employment centers: the Galleria/Uptown area and Upper Kirby/Greenway Plaza. 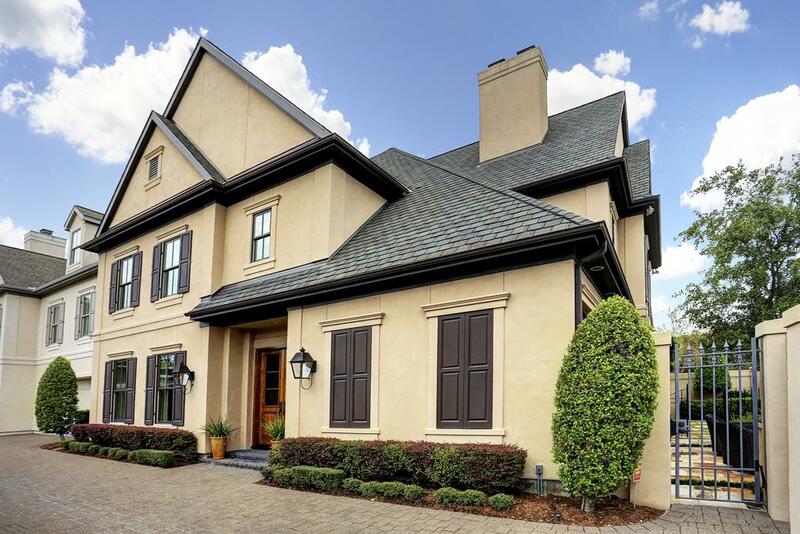 River Oaks, Houston’s most expensive neighborhood, is a stone’s throw away. The Uptown Houston district features about 23 million square feet of office space and some 2,000 companies. Greenway Plaza, on the other hand, is a mixed use development with 10 commercial buildings. For retail, residents can walk the few blocks to the Highland Village Shopping Center, an upscale retail hub covering 15 acres. The River Oaks District, another high-end shopping center, is located a few blocks away from the neighborhood. More options are available nearby, including the Galleria, Rice Village, and Uptown Park. 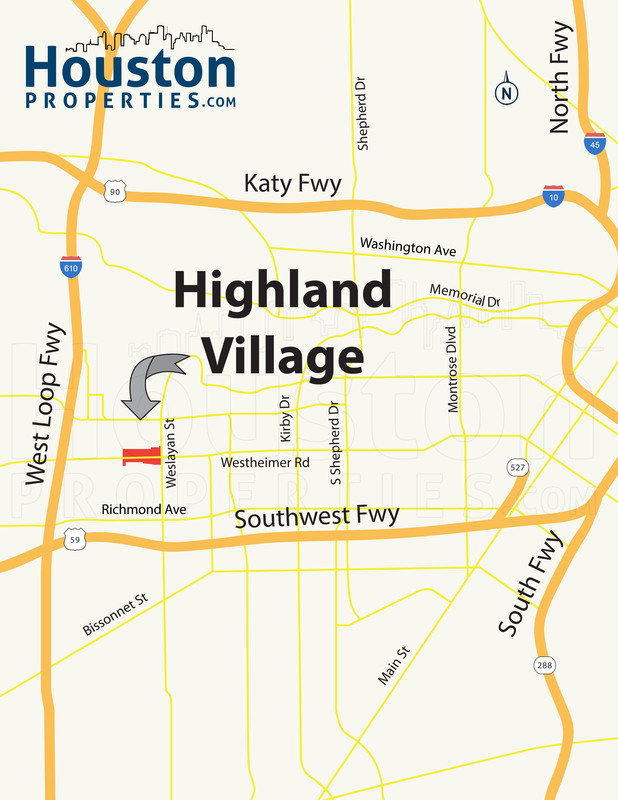 Though surrounded by some of Houston’s busiest hotspots, Highland Village is residential. Made up of around 80 single-family homes, the neighborhood covers six blocks (Chatham, Essex Lane, Betsy, Suffolk, West Alabama, and Drexel). Highland Village’s deed restrictions help maintain the neighborhood’s atmosphere. Highland Village homes are zoned to the Houston Independent School District (HISD). Highland Village real estate have posted steady appreciation rates over the past decade, with median sales price of homes in the area clocking in at over $700,000. Highland Village is also among the best Houston neighborhoods in terms of land value appreciation. With its mix of updated ranch-style homes and larger and newer custom-built homes, homebuyers have a variety of choices. Several factors drive home values in the neighborhood, including its proximity to major retail and business districts, high accessibility, and high quality schools. 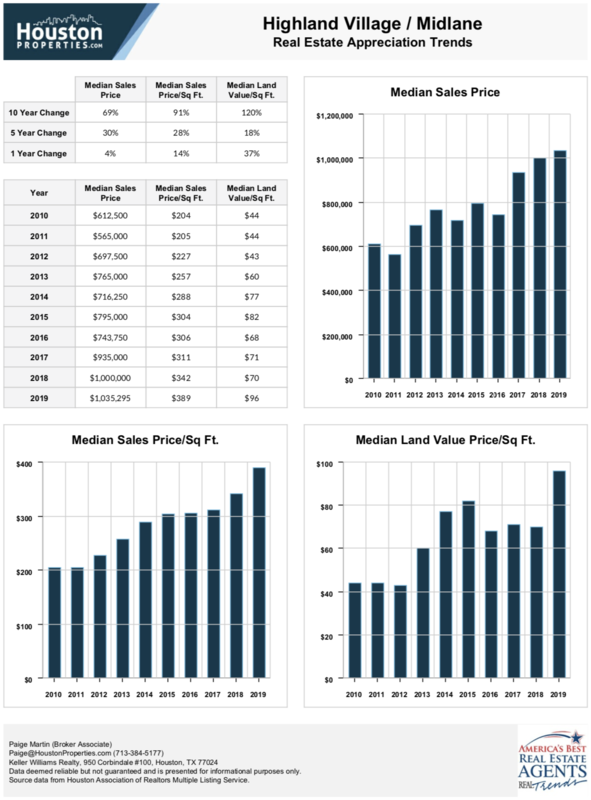 For updated information regarding Highland Village real estate pricing and trend analysis, please contact Paige Martin at Paige@HoustonProperties.com. 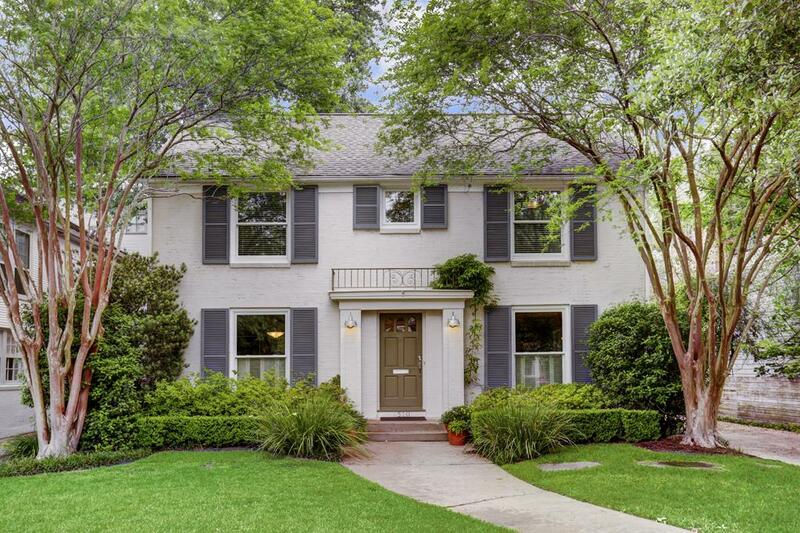 A relatively small community, (data sourced from the Houston Association of Realtors website indicates that there are only 85 single-family homes in the neighborhood), Highland Village is largely a collection of older homes from the 1950s. A good number of these vintage homes have been updated and renovated, though some have been torn down during the 1990s and 2000s to make way for larger homes. Ranch and traditional style homes are common in the area, though newer homes feature other architectural influences. Floor plans typically offer around 3 to 5 bedrooms and 2 to 3 baths. Lot sizes can range from 6,000 to more than 9,000 square feet, while living areas can be between 1,700 to 8,000 square feet. Pricing for Highland Village single-family homes for sale varies depending on size, location, and the condition of the home. Older and smaller homes can go for $400,000, while larger, and newer homes can sell for more than $3,000,000. There are no townhomes in Highland Village. The neighborhood’s deed restrictions limits the construction of multi-family dwellings and townhomes. There are, however, townhomes available in other Inner Loop neighborhoods like Camp Logan, Rice Military, and Montrose. Due to the neighborhood’s deed restrictions, there are no mid- or high-rise condos available in Highland Village. Nearby neighborhoods like River Oaks and the Galleria/Uptown area, however, have several residential high-rises within their borders. S.N. Adams established Highland Village, so named for his native Scotland. The neighborhood of Highland Village was built around the mid-1940s and early 50s, and like most neighborhoods established during the period, most Highland Village homes feature traditional and ranch-style designs. Some of these older bungalows still line the neighborhood’s streets, though others have since been replaced with new and bigger homes. Adams also developed the Highland Village Shopping Center during the mid-1940s. One of Houston’s first shopping centers, Highland Village has undergone a lot of changes, though it remains a destination for retail, dining, and entertainment. The eponymous Highland Village is perhaps the neighborhood’s best landmark. The 50-year old shopping center was developed with the surrounding neighborhoods in mind. It has changed hands a few times, but has remained one of Houston’s retail destinations for its upscale boutiques, great collection of restaurants, and its variety of specialty stores. Establishments in the area include the Apple Store, Central Market, and P.F. Chang’s. The River Oaks District is a few blocks away from Highland Village as well. The upscale shopping center features more than 250,000 square feet of retail space and a variety of boutiques, restaurants, and outdoor cafes.